Best Mobile Ad Formats and Ad Sizes to Increase Viewability and Revenue. 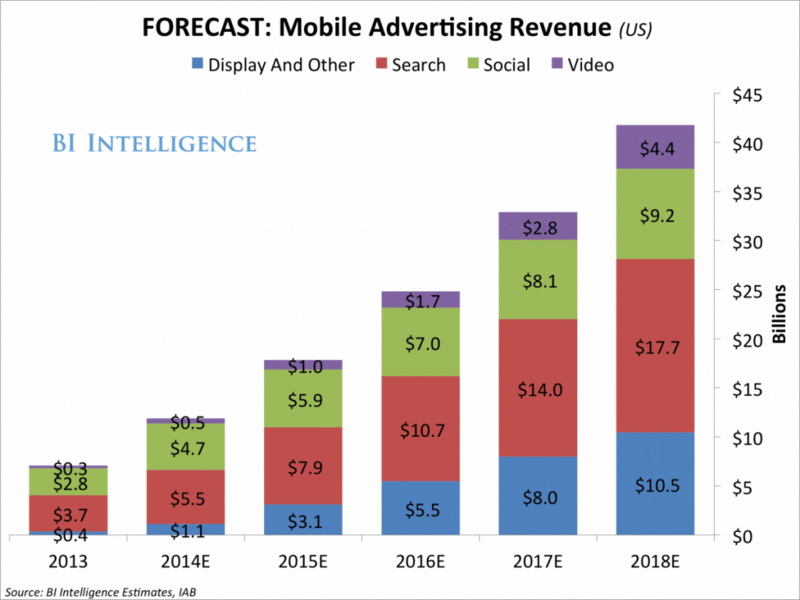 Display ads in mobile brought in $10+ billion in revenue this year. 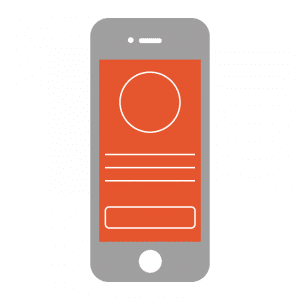 What are the right mobile ad formats and the best mobile ad sizes? The question never gets old and publishers are still searching for the right answer. Well, as an SSP, we decided to put an end by curating this ultimate guide. From best performing mobile ad sizes to IAB’s rising mobile ad units, you’ll learn everything to double your mobile ad revenue. According to eMarketer, mobile ad spend will surpass TV in the largest ad market this year and it will account for 69.9% of all digital advertising. 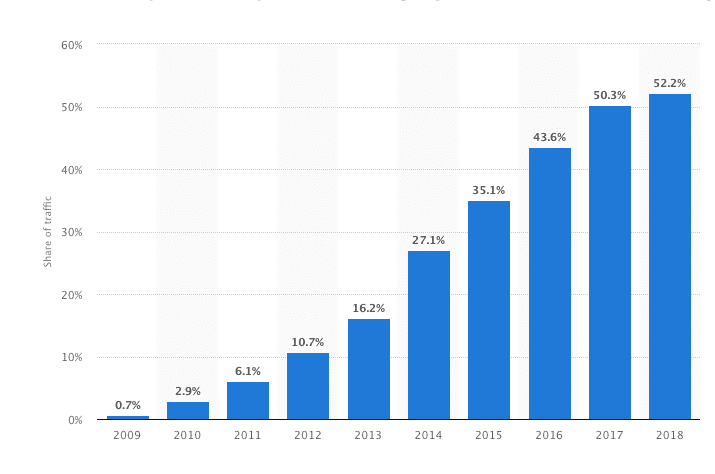 Another interesting data compiled by Statista shows that 52.2% of all the traffic is originated from mobile devices in 2019. Hence, it is obvious that both users and advertisers are getting into the mobile every year. And, they aren’t going to slow down. As a publisher, you know where the focus should be? Of course, search and social are also booming and contributing to the growth in mobile advertising. But that doesn’t mean there’s nothing left for you. In fact, brand marketers are open to putting ads on your site if you have the right formats and ad sizes in place. Display ads brought in $10+ billion in revenue this year. Besides, ensuring you have the right ad sizes/formats increases your CPMs, viewability, and engagement rates. So, in this guide, we’ll be exploring the right mobile ad formats, best mobile ad sizes, and learning how to pick the right ones for your site. With everyone coming up with their own and rich-media mobile ad formats, it is easy to get overwhelmed and confused. But as a publisher, do you really need to display all the fancy ad formats to your users? Ask questions and make sure there is a rising demand for the format. Else, you would be sacrificing the user experience for nothing. Let’s start with the standard ad formats and ad sizes which have buyers all around the globe. Standard mobile banner ads are the most popular and widely-used ad format to monetize mobile traffic. Both publishers and advertisers flock towards the banner ads as soon as they’re into mobile advertising. That being said, you can expect to face some hiccups from the ad fraudsters while running iab banner ad units. – Easy to implement and optimize. – Can yield better CPMs with the right ad placements. When it comes to mobile banners, you can bet on three ad unit sizes – 320*250, 320*50 and 300*50. Of all 320*250, also known as ‘medium rectangle’ is proven to help publishers. Even Google included the ad unit size in its “Top Performing Ad Sizes” list. At first, Google’s ad policy restricted the publishers from placing the 300*250 unit above the fold. But now, you can do so. Advertisers would be willing to pay more as users will be seeing the ad as soon as they open the webpage. We stick to the above-mentioned ad banners. But if you’re looking to see what are other options available to try, you can refer the most common display ad banners. Obviously, common ad sizes will have greater demands and thereby getting you the best fill rate and eCPM. As suggested by Google, here are the most common mobile ad banners. However, you need to be wary of the ad placement. We advise you to follow Google’s recommendation. All the three standard mobile banners generate better Click-Through Rates and Engagement Rates. Is the banner ad right for you? To be frank, mobile banners are one of the best options available for mid-market and premium publishers. You can claim an eCPM of up to $100+ with the right placement and audience engagement rate. Especially, these are proven to help publishers who’re looking to add more ad units or just beginning to monetize. They are one of the fastest growing ad formats in the industry. As users are watching more video content every day, advertisers have already started pouring the marketing budget into the video ads. Besides, video ads can tell a story and brand recall is way higher than the banner ads. 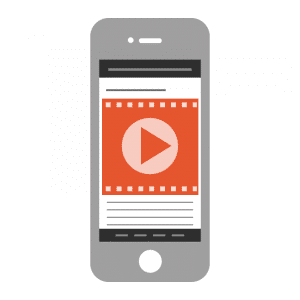 When it comes to mobile video ads, you can rely on – 320*480 and 480*320. Besides, you can run outstream video ads in 320*250 unit. They all can generate higher CPMs and Video Completion Rates (VCRs). Is the Video Ad right for you? Before running video ads, you need to decide on the type. Is it going to be outstream or third-party video distribution (Instream)? Either way, you need to have a stellar page load time and optimization technology in place. Mobile interstitial ads are the visuals which pops-up when a user try to close/switch the webpage. They offer engaging content and call to actions and covers the complete mobile screen. These kinds of ads are more common in gaming apps and website which requires users to interact often. You can try the full-screen size or opt-in for other standard sizes too. When it comes to demand, advertisers with the goal of conversion (not brand awareness) are increasingly experimenting with the interstitial format. – Increased CTR than banner ads. Most popular interstitial ad size is 320*480. 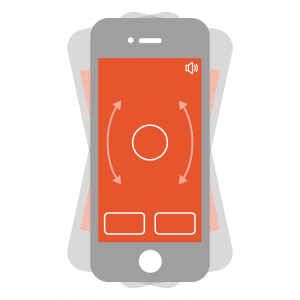 However, it captures the full screen of the mobile and stalls the user. So, you should use them sparingly. If you’re willing to try interstitial ads, you need to primarily consider two factors – Users and page load time. If the users prefer to stay on the site rather than bouncing off, you may need to try other formats. Because interstitial ads usually cover the screen and ask the user to close it or click it. If your average page views are over 3, then you’re driving users away with the ad. When the page load time is higher than the acceptable value, you can’t run interstitial ads as they can make the page even slower. 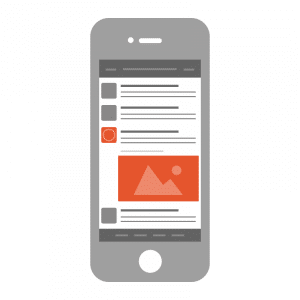 Mobile native ads are the ones which blend well with the content on your site. They are non-intrusive and the most subtle form of advertising. However, they are proven to earn higher views and shares than the other ad content formats. Most often, users will engage with the content without realizing that it is an ad. If the ads are matching the context of the page, the CTRs can go as high as 50%. – Best option to monetize without hampering user experience. – Better ad viewability and engagement rates. 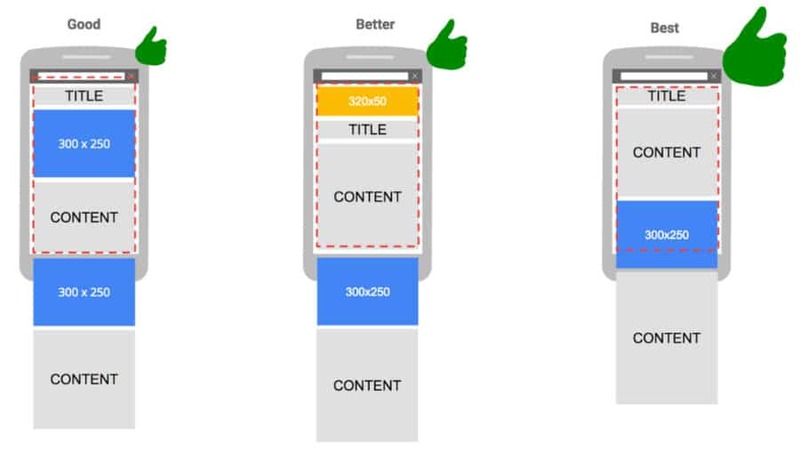 When it comes to native ads on mobile, you can try 320*480 and 300*400. However, you can run ad units which are native to your content. But accessing the demand will be harder that way. Any publisher with a highly engaging audience can yield higher CPMs with native ads. Though they can be left unnoticed, relevant ads can gather more views and conversions for advertisers. So, if you have a targeted niche or first-party data to supplement the campaign, you can go with this format. Rich Media Ads are the ads with rich formats such as videos, GIFs, and audio. A user can interact or even complete the intended action without leaving the webpage. Publishers generally serve rich media ads by combining display and interstitial ads. Though the format is popular among the app publishers, rich media formats such as Expandable ads are also used in mobile web. They offer better ground for advertisers to showcase their service/product completely. According to a study by the IAB and comScore, rich media ads result in 79% higher user engagement, an 18% increase in brand recall, and a 23% increase in message recall. In addition, 43% of the respondents said the rich media ads grab their attention better than the banner ads. However, it is essential to keep the number of ads to minimal to prevent bounces and user frustration. – Higher CPMs/CPAs than the other ad formats (excluding video ads). – Performs well with the right context. Expandable ads with 320*480 and 320*320 are considered as the best option. If you have the right team to constantly optimize and approve the ads, then you can give it a try. Besides, you need to partner with the right ad tech vendor to ensure they can handle and deliver the rich media ads properly. Of all, make sure your users stay longer than at least 2 minutes before exploring the format. IAB released the rising ad units which can be a “canvas for the next generation of mobile advertising”. As they are new to mobile advertising, not many ad exchanges are offering the format and the demand is pretty low. However, they will be attracting more publishers and advertisers in the near future. So, we included it here to let you keep an eye on them. Adhesion banners are the tenacious ad units at the top or bottom of the mobile screen which can be expanded to full screen upon user action. Mobile sliders are also tenacious ad units which stay at the bottom of the screen. It doesn’t obstruct the user in any way. Once slid, the user will be able to see the complete ad with the call to action. With the sizes of mobile ads being too small, ad units are utilizing users-initiation to take the full screen thus, ensuring the brand message is delivered clearly and conveniently. As we always say, there’s no one-size-fits-all solution in adtech. You should explore, experiment, and then settle on the right ad formats and ad sizes which are yielding higher CPMs and enhancing the user experience as well. Whether you are using display ad networks or programmatic seller (SSP), this piece will come in handy. We’ve listed all the best mobile ad sizes and mobile ad formats you can try in 2019. It’s up to you to pick the suitable ones and ignore the rest. Let us know how it goes in the comment.